Posted 6/2/2009 11:18am by Penn's Corner Farm Alliance. Back by popular demand, you can now sign up for our last prorated version of the 2009 Penn's Corner CSA membership. We are accepting members for a new 12 week CSA share that goes from August 18/19 until the first week of November. You'll receive the full bounty of the growing season--heirloom tomatoes, peppers, and sweet corn; peaches, and pears; lettuces, herbs, and free range eggs. You can sign up right here on our website. Please note that the final deadline for signing up is August 11. Sign up now! Posted 5/13/2009 10:27am by Penn's Corner Farm Alliance. Think your food choices go unnoticed? Think again. The local food movement is, as you probably know, growing is scale and scope every year. For many reasons, people like yourself are choosing to buy food from local people and places that they know. And it looks like major corporations like Frito-Lay (owned by PepsiCo.) are taking note. Ultimately it is up to you, the consumer, to determine the difference between a box of CSA produce and a bag of potato chips. Posted 5/8/2009 11:23am by Penn's Corner Farm Alliance. We're only a month away from the beginning of the Penn's Corner 22-week Harvest Share CSA! If you haven't signed up yet, now is the time. Memberships are going fast, and it appears that we will sell out in the coming weeks. Don't miss your chance to receive weekly deliveries of the best fresh & local produce every week from June to November. North Side, Resaca Place (Wednesday); Squirrel Hill, S Negley Ave (most likely Wednesday); Scott Township, Borland Rd (Tuesday); Churchill, Orlando Place (Tuesday); Murrysville, (tentative, but most like Wednesday). Dont' forget to stop by the May Market at Phipps Conservatory to say hi to the farmers at the Penn's Corner booth, and have a great weekend! Posted 4/24/2009 6:50am by Penn's Corner Farm Alliance. Are you ready to start your garden? 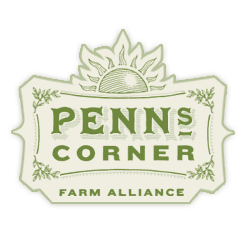 Two of our growers, Goose Creek Gardens and Pucker Brush Farm will be hosting the Penn's Corner Farm Alliance booth at the Mt. Lebanon Earth Day Celebration. They will have available for sale 30+ variaties of culinary herbs as well as 20+ types of heirloom tomatoes. Hanging strawberry baskets, lettuce bowl kits, and horesradish. They will also have fresh cut greens, such as spinach, arugula, swiss chard as well as other memebers honey, apple cider vinegar, and fresh, free range brown eggs. Posted 3/23/2009 3:54pm by Penn's Corner Farm Alliance. Now that Spring is officially here, it's time to get excited about the upcoming season of available local foods. The mild, sunny weather of the last few weeks has been great for our farmers. Fields are plowed, plants are seeded, and plans for a great season are under way! A great way for you to kick off this season is by attending the Farm to Table Conference at the David L. Lawrence Convention Center in Downtown Pittsburgh. It is coming up on Friday April 3 and Saturday April 4. Penn's Corner will have a booth at the conference farmers market. We will have a variety of early season produce, plants, and other farm foods available for purchase. Plus, we will be more than happy to answer any of your questions about the CSA or just to talk farming! The Conference will be filled with an amazing variety of speakers that have a vast knowlege about local food and farming. This conference is truly a wonderful resource for our region. Come join us and be a part of it! Posted 2/24/2009 9:41am by Penn's Corner Farm Alliance. Believe it or not, the end of February is now quickly upon us. If you've been considering a CSA share, this is a great time to do it. Our early sign-up discount only runs until the end of the month. So don't miss the chance to secure your CSA share and save some money in the process! All members who sign up and pay in full by February 28 are eligible for an instant 3% discount on their CSA share. You can sign up and pay right here on our website. Thanks for financially supporting your local farmers through the winter. We look forward to repaying you before long with a great season of fresh and tasty foods from our farms! Posted 2/13/2009 1:33pm by Penn's Corner Farm Alliance. Penn's Corner is looking for qualified and motivated individuals to join our staff. Our cooperative continues to grow, and we would like to hire an office assistant as well as a delivery driver. Both postions have the possibility of being either full or part time jobs. To view the job descriptions, please follow the links above. To apply, please send a resume and cover letter via email to Penn's Corner at pennscorner@gmail.com by Monday February 23rd. Thanks for considering the opportunity. We hope to hear from you! Posted 2/5/2009 2:55pm by Penn's Corner Farm Alliance. 1. This is an a la carte sale with products from our Penn's Corner farmers. As a member of the 2008 or 2009 Penn's Corner CSA you are free to order produce and local foods from the Yard Sale. As a non CSA member, you are still able to purchase, however, there is a $5.00 delivery fee. We reserve the right to require a $20 minimum order for delivery. 2. Our order deadline is 9AM next Thursday, 2/12/08 (7 days from now). 3. Please follow the link to the Exel file and fill out the attached order form (including your name, email, and phone). Email the Excel file back to us at pennscorner@gmail.com. Feel free to make any clarifying remarks about your order (or send an itemized order) in your email. 4. Remember, if you order beef or pork, it will arrive fresh, not frozen. You may want to bring a cooler with you to the pickup. Depending on the size of your order, you may have multiple boxes and/or bags. Please be careful and accurate when picking up your order. 5. Our Yard Sale delivery day is Friday 2/20/08. At this point, we only have pickups at the locations listed below. However, we will consider any offers to host a delivery site for this event. If that happens, we will post the update on our website. You may also feel free to call or email to clarify any pickup logistics. d. 1156 Gobblers Run Rd 15774 at Pucker Brush Farm in Shelocta (pickup starts at noon). 6. Once the orders are finalized, we will send you an itemized invoice via email or else at the time of delivery. We will also send you a link to pay for your purchase via Google Checkout. At that point, we ask that you either pay for your purchase with a credit card on Google Checkout or else send in a check to Penn's Corner. If possible, we ask that you finalize your payment before picking up your purchase. Feel free to contact us if you have concerns. On a different note, don't forget to sign up for your 2009 CSA Share as well. There's less than a month left to receive the 3% discount for memberships paid in full by the end of February. In case you didn't hear, we also added a few new CSA pickup locations lately: Ross Township, Cranberry Township, and Regent Square. The Penn's Corner website has a map of all CSA locations. Let us know if you have any other suggestested sites! Posted 1/30/2009 3:15pm by Penn's Corner Farm Alliance. Don't forget to sign up for your Penn's Corner CSA share. Our farmers are busy purchasing seeds and making plans for the season to come. Your purchase of a CSA share in the winter months helps pay the bills while the snow flies. Then, come spring, summer, and fall; you'll receive your end of the bargain every week in the form of fresh, seasonal fruits and vegetables from our farms. We're also still adding new CSA pickup locations. This week we added Regent Square, Ross Township, and Cranberry Township. So help us spread the word in the neighborhoods. Plus, we're still looking for more locations (especially on the North Side, Wexford, and Monroeville areas). Thanks again for your continued support of local farmers in Southwestern PA! Sign Up for 2009 CSA Memberships! Posted 1/15/2009 9:31am by Penn's Corner Farm Alliance. The 2009 Penn's Corner CSA sign-up is ready to begin! We can't wait to get started. If you've been waiting to join Penn's Corner for the 2009 season, then wait no more. This year we've made it easier than ever to join the CSA. If you're ready to join, simply follow this link to fill out the membership application on our website. Or, if you want to find out more information first, follow this link to view our 2009 CSA brochure. Please note that if you sign up and pay in full by the end of February, you will receive a discounted price! And, we are still looking for some new CSA delivery sites. If you are willing to consider hosting, please let us know.